You know, folks know you quilt so they think you can sew anything up in a flash right? To some, quilting and sewing is the same thing. Luckily, when a co-worker asked me to make a birthday present for her son, I could do it. 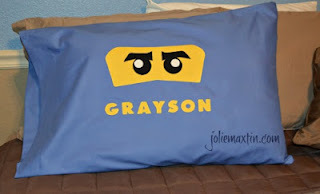 She wanted a Ninjago pillowcase and she even had a tutorial for me (whew and thanks to Amber at Crazy Little Projects). So....after placing a fabric order and getting some matching thread - Waaa Laaa! My first commission project completed. Here is it, ready to give away! It's so cute Julie! 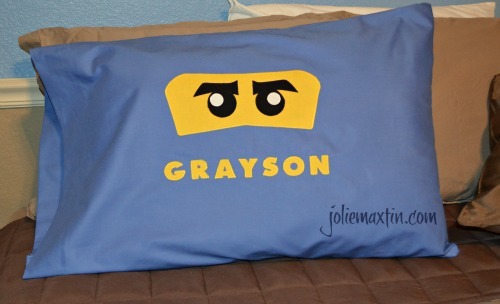 Grayson will love it! Awesome cushion! My boyo loves Ninjago at the moment - will have to check out the cushion. Though he may just have to count himself lucky to get the LEGO playmat I'm making! It's enough work as it is!